It is absolutely no surprise that you had a lot to say about how many bridesmaids is too many bridesmaids. The results of our poll were heavily skewed toward a preference for smaller bridal parties; 44 percent of you felt that more than four bridesmaids was too many, and 40 percent of you felt that more than six ‘maids by the side of the bride was excessive. Over on the other end of the poll, 2 percent of you were all, “BRING ON THE LAVENDER TAFFETA!” selecting the “There’s no such thing as too many bridesmaids” option. Yes! She had to have met the bride playing lacrosse or something, girl reacted fast! I also appreciate how the third girl from the right almost knocks over the second bridesmaid from the right trying to make her escape. Every maid for herself! 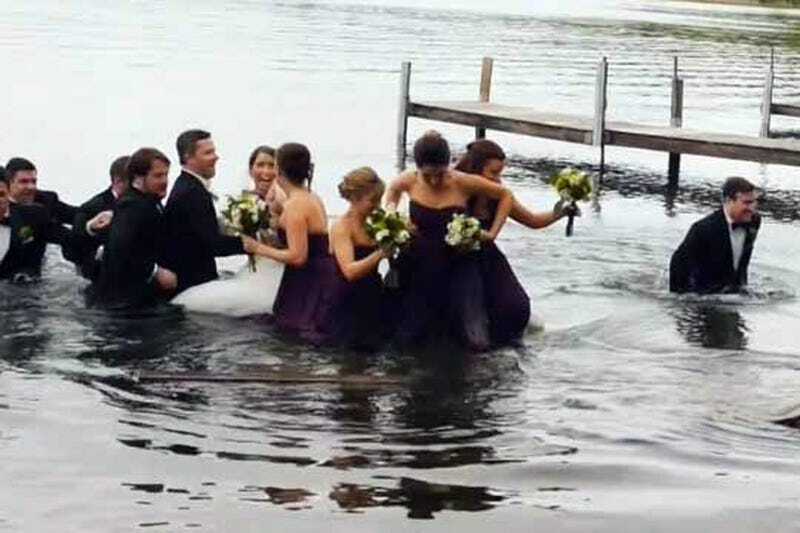 We salute you, Right Bridesmaid. Take your rightful place in the Hall of Marvins.